Danang has more to offer than you might at first suspect. Its greatest offering is Son Tra Peninsula, also known as Monkey Mountain, which lends itself to the best motorbike day trip in the region. There is something for everyone on the peninsula whether it be a secluded beach, a visit to a pagoda or for the more adventurous, paragliding. Just driving around the area trying to spot monkeys is a joy in itself. Here is a suggested tour taking in what we think are the 6 most interesting sites plus more. In order to see our map of the island click here. In our opinion, taking an anti-clockwise tour is best as this will give you the morning light as you start and head eastwards and the fading evening light as you end the day. This should allow for some great photo opportunities. The first stop on this route will take you to Linh Ung Pagoda. You will then go past Ghenh Bang, which is a small and remote cove with interesting geographic features. 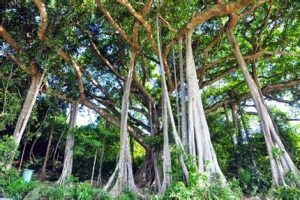 Who doesn’t want to see an 800-year-old tree along Son Tra Peninsula? There are one or two hawker stalls set up and you can buy some snacks and drinks. It is quite shady here and can be a nice place to hang out (amongst the 25 or so aerial roots) and take some photos. 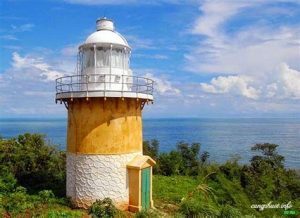 Built by the French in the 1950s, Son Tra Lighthouse is a great place to experience the sea breeze and hopefully catch a glimpse of the Grey Shanked Douc Langur. It sits just more than 200m above sea level and offers wonderful views. On your way to the next stop, you will pass the entrance to the Intercontinental Sun Peninsula Resort on the Son Tra Peninsula. This is a great place to stay, if you have the budget. You have the choice of taking the coastal route or going up Monkey Pass. Both of these are good routes but Monkey Pass is a little steeper. At what is almost the highest point of the island, and near the chess board and an old helicopter landing site, is the paragliding take-off site. All of these spots are quite close to each other along the Son Tra Peninsula, so we have combined them for one stop. 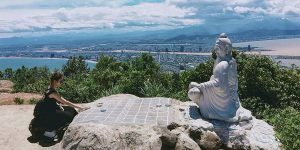 The Chess Board monument to Confucious is probably the most congested point of the mountain, and you might find yourself jostling for position to get that selfie. The helicopter landing pad is now just a patch of grass and is very easy to miss. If you are lucky, you will see pilots taking off and you can contact Danang Paragliding in order to book a tandem flight. On your way back down Monkey Mountain, you can stop off at one or both of these beaches for a refreshing dip in the sea. Black Rock Beach is quite wild and exposed. There are many rock pools to explore and it is also good for snorkeling. The black rocks are interesting but not much of an attraction. Golden Sand Beach is a little more populated and there is a resort here. It is also a good place for fishing, snorkeling, and general swimming. A fantastic site for history buffs. This is the burial ground of French and Spanish soldiers who fought and died trying to take control of Danang in 1858. It is possibly the only place in Vietnam where foreign soldiers lie buried. It is an inconspicuous little place but worth taking the time out for a stop. Other places to see are the Boom Boom Rock and the Lookout near the Radar station. There is very little petrol for sale on Monkey Mountain along the Son Tra Peninsula other than some makeshift stalls near the Sun Peninsula Resort. We have marked several petrol stations near our shop and at the base of the mountain. You should fill up at these places or prepare for a long, hot walk! There are often landslides on these steep roads so you will need to be a competent driver to avoid boulders that have fallen and to cope with the gravel. Also, good footwear will protect your feet and prevent slipping. Protect yourself from the sun as it is very easy to get burnt. Use sun cream and cover-up. You may get a little hot but a day on the mountain will fry you. Take a bottle of water with you as you will not notice how dehydrated you get as the wind on the bike wicks away moisture from your body. You can buy more to drink as some stalls by the Banyan Tree and a few hawkers at Linh Ung Pagoda, but other than this there is little else on the mountain. There are several military installations here, mostly radar facilities on the peninsula, so if you see military personnel, slow, stop, and follow their instructions. You can take any of our bikes for this trip but we suggest that you only take one person on the Honda Cub or the Yamaha Mio. This is because they are not strong enough to get two people up the steep inclines. We have Automatic, Semi-automatic and Manual bikes for you to choose from and prices range from $7usd to $35usd per day. You can see our range of bikes here and out terms and conditions. A day out on Son Tra Peninsula by motorbike is well worth the effort. There are so many things to see and do though it seems like a world away from the city area. The history, culture, wildlife, and adventure are sure to satisfy you.